The rain is falling on Spitalfields, upon the church and the market, and on the streets, yards and gardens. Dripping off the roofs and splashing onto the pavements, filling the gutters and coursing down the pipes, it overflows the culverts and drains to restore the flow of the Black Ditch, the notorious lost river of Spitalfields that once flowed from here to Limehouse Dock. This was the watercourse that transmitted the cholera in 1832. An open sewer piped off in the nineteenth century, the Black Ditch has been co-opted into the drainage system today, but it is still running unknown beneath our feet in Spitalfields – the underground river with the bad reputation. The shades of Autumn encourage such dark thoughts, especially when the clouds hang over the City and the Indian Summer has unravelled to leave us with incessant rain bringing the first leaves down. In Spitalfields, curry touts shiver in the chill and office smokers gather in doorways, peering at the downpour. The balance of the season has shifted and sunny days have become exceptions, to be appreciated as the last vestiges of the long Summer. On such a day recently, I could not resist collecting these conkers that were lying neglected on the grass in the sunshine. And when I got home I photographed them in that same Autumn sunlight to capture their perfect lustre for you. Let me confess, ever since I came to live in the city, it has always amazed me to see conkers scattered and ignored. I cannot understand why city children do not pick them up, when even as an adult I cannot resist the temptation to fill a bag. In Devon, we raced from the school gates and down the lane to be the first to collect the fresh specimens. Their glistening beauty declared their value even if, like gold, their use was limited. I did not bore holes in them with a meat skewer and string them, to fight with them as others do, because it meant spoiling their glossy perfection. Instead I filled a leather suitcase under my bed with conkers and felt secure in my wealth, until one day I opened the case to discover they had all dried out, shrivelled up and gone mouldy. Let me admit, I feel the sense of darkness accumulating now and regret the tender loss of Summer, just as I revel in the fruit of the season and the excuse to retreat to bed with a hot water bottle that Autumn provides. I lie under the quilt I sewed and I feel protected like a child, though I know I am not a child. I cannot resist dark thoughts, I have a sense of dread at the Winter to come and the nights closing in. Yet in the city, there is the drama of the new season escalating towards Christmas and coloured lights gleaming in wet streets. As the nights draw in, people put on the light earlier at home, creating my favourite spectacle of city life, that of the lit room viewed from the street. Every chamber becomes a lantern or a theatre to the lonely stranger on the gloomy street, glimpsing the commonplace ritual of domestic life. Even a mundane scene touches my heart when I hesitate to gaze upon it in passing, like an anonymous ghost in the shadow. Here in Spitalfields, I have no opportunity to walk through beech woods to admire the copper leaves, instead I must do it in memory. I shall not search birch woods for chanterelles this year either, but I will seek them out to admire in the market, even if I do not buy any. Instead I shall get a box of cooking apples and look forward to eating baked apples by the fire. I have been busy cutting up broken pallets and scrap timber from the streets, and I already have a respectable wood pile stacked up. I am looking forward to lighting the fire. I am looking forward to Halloween. I am looking forward to Bonfire Night. I am looking forward to Christmas. And I always look forward to writing to you every day. The Summer is over but there is so much to look forward to. 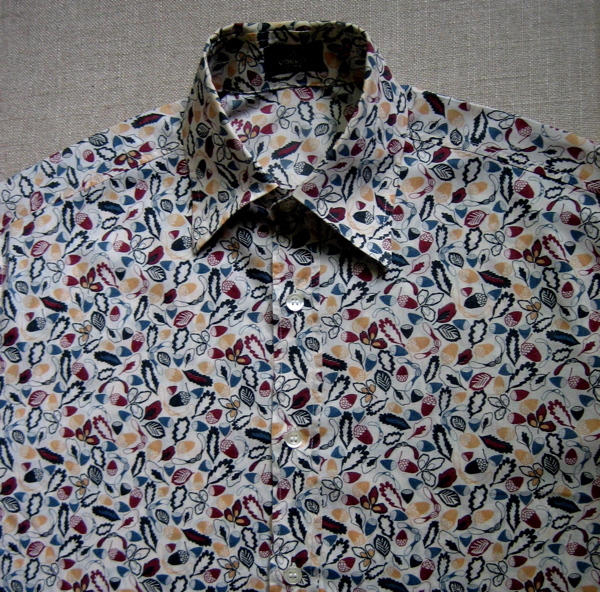 My Autumn shirt, the counterpart to my Spring shirt. You can visit the Spitalfields City Farm to celebrate Apple Day on Sunday 17th October. Thank you for my first glimpse of autumn this year. Oh, a few trees sport yellow leaves on my street, but they feel an anomaly when temperatures have hovered between 90 and 110 all week. But today stacks of orange pumpkins lined the front of the supermarket, so maybe autumn is on its way here, too. Happy October, Gentle Author. Ah, the richness of seasons! This was a very evocative piece. Here in Doha the summer is refusing to pass. Still hot days and humid nights. No English variety. What a lovely picture of Autumn in Spitalfields I feel less gloomy now. I’m also baffled by the children who ignore conkers. It’s people my age who can’t walk past them! for autumn, i am going to make some of maida heatter’s marmalade gingerbread, recipe at p 296, and perhaps you’d like some too. it sounds good for a cold wet afternoon with TEA. 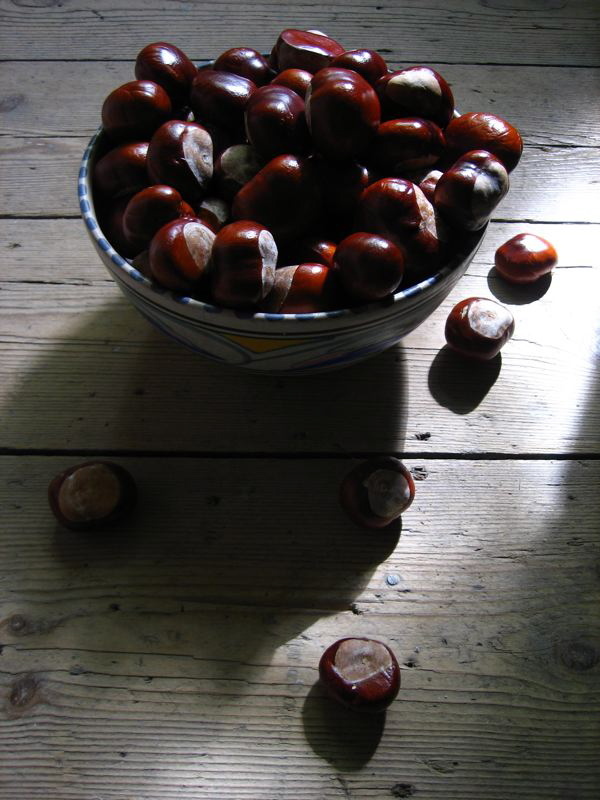 Your picture of conkers in a bowl is beautiful. I picked some up walking home in the rain on Saturday there is a plethora of them just off Shooters Hill. No idea what to do with them but they were too tempting to leave to rot so thank you for your inspiration I shall simply put them in a bowl and admire them. I too love to glimpse a lit room from the street or road. I love looking at their decor and whether there are bookshelves to explore. All too soon the scene is gone and I pass on in the gloom. Yes, I dread winter too, never used to ,maybe it is a symptom of growing older. Now I understand some peoples’ desire to escape the British winter. Enough ! we still have a soft Autumn to enjoy and the last couple of days have been beautifully sunny.